iAdapter 6 Switch Access Ready via Bluetooth. The NEW iAdapter 6A2 with Switch Access Ports is fully compatible with the iPad Air 2 & Pro (9.7"). 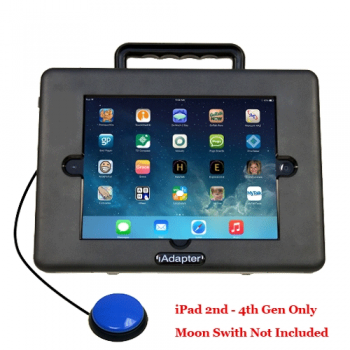 Built for the new iOS from Apple™, we have created a whole new way of accessing your iPad utilizing Bluetooth technology! You'll have the ability to control the iPad's iOS system via emulated Space and Enter keys. If you need a more App specific approach within iOS, we can have our system emulate the ~1 and ~3 commands. *Moon Switch is not included.